Luton to Clapham Junction Taxi Service : If you are travelling in London you most definitely will need to know a little about the transportation system here. The most important stations are the hub ones and they are the most frequented . Clapham Junction is a transport hub and a major railway station in Clapham district. The station is one of the busiest in Europe due to its connection with Waterloo and Victoria stations. At the over ground station you will find the West and East London Lines. The station has 17 platforms and is the host of more than 2000 trains each day. If you are looking for a connection with Windsor, Brighton or Waterloo, this is the place to go. On the other side if you are travelling and your flight is departing from Luton airport you will find it a little bit difficult to reach the destination. From Clapham Junction you will have to take the tube to Victoria Station, from there you will have to change to St Pancras and after that take the bus to the Airport Bus Station. The journey will take about 1 hour, not taking into account the connections. Another option will be to take the bus from Clapham Junction to Victoria station and from there take the Green Line to Luton. This journey will take around 1h and 41 minutes. Another option is to book a minicab service. London is very busy all year round and if you do not know the traffic or the public transport means and want to save some time you can always book a Luton to Clapham Junction transfer with 247 Luton Airport Transfer. We are a reliable company that is mostly concentrated on providing excellent services to our customers. If you are either a single person, family or a group, we have a variety of vehicles that can accommodate from 4 up to 19 passengers with normal, executive or VIP vehicles. Is you are looking to book a minicab journey with us you should probably know that we have an excellent booking platform online and you can also get in touch with our professional team of operators via email, phone or live chat. A Luton to Clapham Junction transfer service will start from 66 GBP and you will have free meet&greet services at the airport included and also free Wi-Fi in the vehicles. 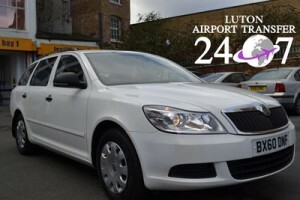 Here at 247 Luton Airport Transfer we will do our best to be on time with every journey. All you have to do is sit back and relax.